What a blessing this smoking is! Perhaps the greatest that we owe to the discovery of America. Blessings are an indispensible part that every ne needs to survive. Blessings can be either from god or from your fellow humans but it is the root of all good deeds. 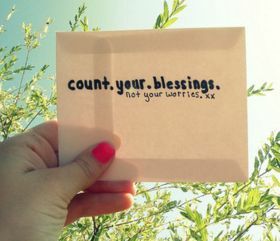 Blessings take many forms; it offers peace of mind, good health, wealth, tranquility, status and many more. But publilius syrus is of the opinion that good health and god sense are two of life’s greatest blessings. But ironically it takes a little reasoning and more sense to recognize the blessings showered on us. We ay immediately recognize the misfortunes and lament over them but if we list out the blessings that are offered to us, it certainly is a longer one. So, don’t fail to recognize the blessings that are offered to us and be grateful to the. Here are some beautiful quotes on blessings given by celebrities, sports persons and political and religious leaders.